Bergen is the southern terminus for Hurtigruten, a week-long passenger ship route with stops along Norway's coast all the way to Kirkenes in the far north of Norway. When sailing to and from Bergen, your ship will pass some impressive bridges and will zigzag to open waters, passing a lot of beautiful inlets and islands. 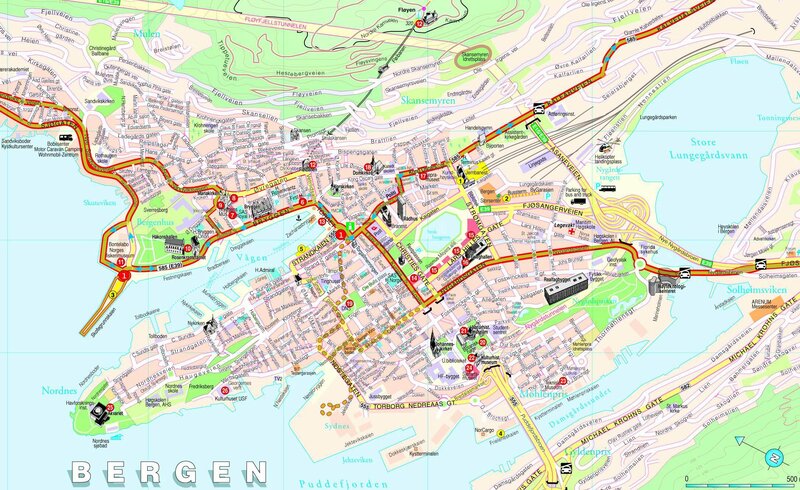 Check here for festivals and events in Bergen when you are in port. There's a number of attractions in Bergen and the surrounding areas. Surveys do however show that most tourists in Bergen find the atmosphere, cultural landscape, and architecture more compelling than the typical sights, so pick a few things to see and spend the rest of your time in Bergen sitting down in a park or café, strolling around the city, enjoying a concert or hiking the mountains. Hop on/off starts right at the cruise terminal of Bergen. All buses which stop at the port will go to the center of town. Pay the driver directly in NOK for a ticket. Within the city center, walking is the best way to get around. You can walk across the downtown in 20 minutes in any direction. The most central streets of the city generally has a good accessibility for the disabled. A 55 minutes long tour by a diesel-powered train imitation starting at Bryggen, traveling around downtown past a nice viewpoint half way up Mount Fløyen. You can also take a trip on the Floibanen (funicular) for amazing views over the whole of Bergen and the surrounding hills. About 2 km from port. The Hop on/off bus stops right at the cruise terminal. As an alternative to the funicular, there is also a cable car, the Ulricken 643 to Bergen’s highest mountain. A bus is available from the fish market & a combined bus, cable car ticket 245 NK or about 40 dollars US. A nice looking restaurant sits on top. Norway is one of the most expensive countries in the world, so are the taxis. Torggaten is the main pedestrian mall and square surrounded by department stores, cafes and restaurants. Bergen is your best bet for souvenir shopping. Norwegian sweaters, t-shirts, postcards, trolls, crystal, jewelry; it is all readily available. Remember that the shops at Bryggen (near the cruise ship dock) tend to be a lot more expensive than the stores in the center of town. McDonalds and other cafes will offer free WiFi.